16 Students, 10 weeks & one crazy ride! I’m behind in my posts, but I wanted to share with you the last exhibition I was involved in. I study Photo Imaging at CATC Design School. I’m actually towards the end of my studies but before I finish, I had to undertake a subject called Exhibition. It is, how it sounds. The class must plan, fund and put on an exhibition and be graded at different stages of the process. The challenges with this class, are around throwing 16 complete strangers together and having them work effortlessly within a set time frame. That being said, the timeframe is only about ten weeks. Ten weeks to plan, get funding, sponsorship, organise media & marketing, shoot the images and have them printed, framed and hung! It is a very tight timeline and it can be emotionally charged at times. I volunteered to be a Project Manager on the event (alongside another student). It presented many challenges and at times it wasn’t always the easiest. I don’t think that Project Managers are always the most liked individuals in the group by the end of the experience. A friend of mine sent me this funny little picture about Project Managing. At the time I probably found it more relevant than funny. But I can see the humour in it now. I did learn a lot from the experience and I think I really benefited from taking the challenge on. Our exhibition was held at Contact Sheet Gallery, from 11/08 to 13/08. Opening Night was on the 12/08. I believe it was a roaring success. I was informed that approximately 180 people attended the event! It was great to see such a diverse range of guests - enthusiasts, lecturers, Industry Professionals, photographers, friends and family. Our event was sponsored by some well known, reputable and awesome entities! Capture Magazine, Better Photography Magazine and the AIPP provided door prizes, support and a guest speaker (in the form of the AIPP President!). Our major sponsor was Nightingale Wines. They provided the wine, which I enjoyed immensely! Blind Bake Catering gave us wonderful support, service and discount in catering! All of which added to the success of the Opening Night, so to all of you I am so thankful. The theme for the exhibition was Entre Lineas - An exhibition that explores the concepts of how we look between the lines of an image to discover the story behind it. Ansel Adams said it best, “there are always two people in every picture: the photographer and the viewer”. This is our journey as photographers and what we see through the lens. More importantly, it’s about what the viewer sees. For everything that we capture, we bring with it our own meaning and intention, as it is a culmination of our personality, interests and life experience. The viewer will also bring their own interpretation, that will determine what they see the meaning they take away from it and how they read between the lines. The artists involved were: Brad Fitzgibbins, Brianna Burford, Bronte Leahy, Byron Martin, Chloe Snaith, Joshua Concepcion, Keira Smith, Lacey Fisher-Evans, Liam Irvine, Meg Mac Sweeney, Michelle Lake, Phillip Osborne, Phillip Pain, Sienna Pyle, Tamara Williams, Tim Searle. 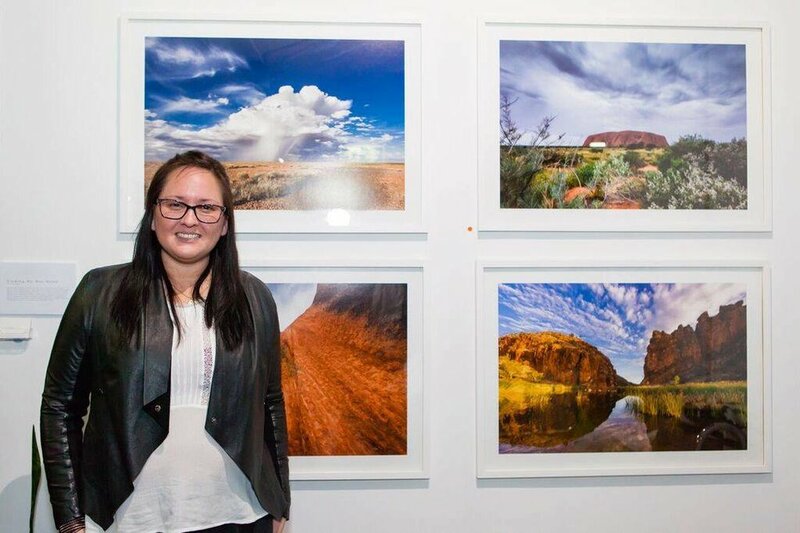 The work I displayed was around my travels through the Australian Outback. 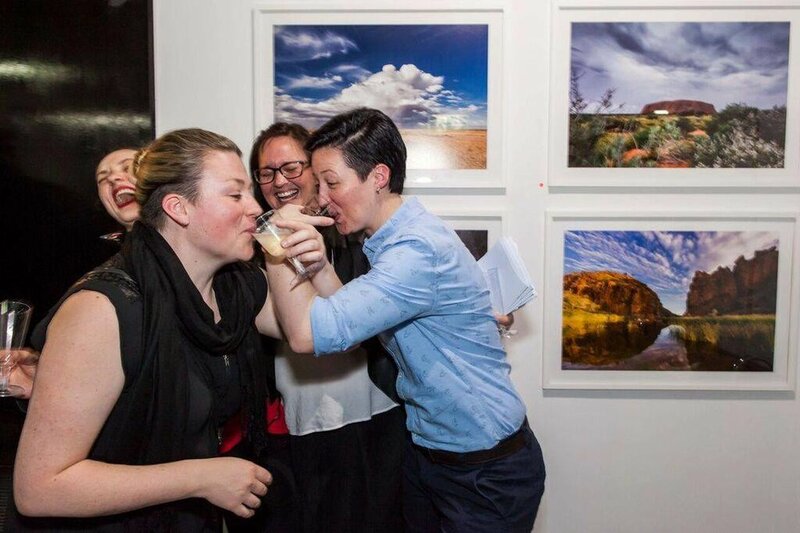 Here are some photos of the event, taken by our fab photographer of the night Caroline Kilby. And, thanks again to everyone that came out to support the event. And on a personal note: to my wonderful friends and family, thank you for your ongoing support, friendship and (throughout this process) patience! I have much love for you all.